What is Lyndon B. Johnson most known for? 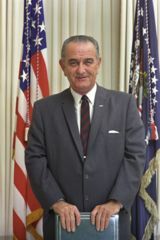 Lyndon Johnson was known for becoming president after President Kennedy was assassinated. His presidency is known for the passage of civil rights legislation and the Vietnam War. Lyndon grew up in a farmhouse in the hill country near Johnson City, Texas. Although his father was a state representative, Lyndon's family was poor and he had to work hard at chores and odd jobs to make ends meet. In high school Lyndon played baseball, enjoyed public speaking, and being on the debate team. Lyndon wasn't sure what he wanted to do when he got out of high school, but eventually decided on teaching and graduated from Southwest Texas State Teacher's College. He didn't end up teaching long before he went to work for a congressman. Soon he wanted to go into politics, so he went to Georgetown University and earned his law degree. Shortly after graduating from law school, Johnson was elected to the U.S. Congress. He served as a congressman for twelve years. During World War II he took a leave of absence from Congress to serve in the war where he earned a Silver Star. In 1948 Johnson set his sights on the Senate. He won the election, but only by 87 votes. He earned the sarcastic nickname "Landslide Lyndon". Johnson served the next twelve years on the Senate becoming the Senate Majority Leader in 1955. Johnson decided to run for president in 1960. He lost the democratic nomination to John F. Kennedy, but became his vice presidential running mate. They won the general election and Johnson became vice president. In 1963 while on a parade in Dallas, Texas, President Kennedy was assassinated. He was shot while riding in a car just ahead of Johnson. 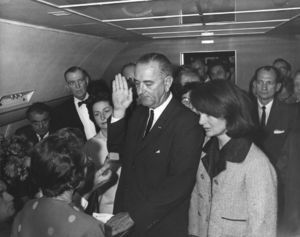 Johnson was sworn in as president just a short while later. Johnson wanted his presidency to usher in of a new way of life for America. He called it the Great Society where everyone would be treated equally and have equal opportunity. He used his popularity to pass legislation to help fight crime, prevent poverty, protect the voting rights of minorities, improve education, and conserve the environment. Perhaps the greatest achievement of Johnson's presidency was the passage of the Civil Rights Act of 1964. This law made most forms of racial discrimination including segregation in schools illegal. In 1965 Johnson signed the Voting Rights Act which allowed the federal government to insure that the voting rights of all citizens regardless of race were protected. The Vietnam War turned out to be Johnson's downfall. Under Johnson the war escalated and U.S. involvement grew. As more and more U.S. soldiers died in the war, Johnson's popularity began to diminish. Many people disagreed with any U.S. involvement at all and protests grew throughout the country. Johnson put his full efforts into gaining a peace settlement, but failed in the end. After retiring to his ranch in Texas, Lyndon Johnson died of a heart attack in 1973. His wife's nickname "Lady Bird" gave them both the same initials "LBJ". They named their daughters so they would have the "LBJ" initials too. Johnson City, Texas was named after a relative of Johnson's. He appointed the first African American to the Supreme Court, Thurgood Marshall. He also had the first African American cabinet member when he appointed Robert C. Weaver to lead the Department of Housing and Urban Development. Johnson once said that "Education is not a problem. Education is an opportunity." At 6 feet 3 ½ inches he was the second tallest president just after Abraham Lincoln at 6 feet 4 inches.